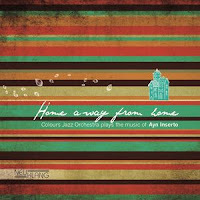 This is a startling album from the outstanding Composer/Arranger Ayn Inserto and the Colours Jazz Orchestra. Since 1999 Ayn has been steadily making a name for herself in the U.S. receiving countless awards but is, currently, perhaps less well-known in the U.K.
A musician writing avant-garde charts in sound, taking risks and creating some of the most complex, sophisticated, and clever music I’ve ever heard. 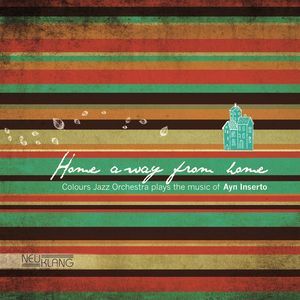 Ayn, an Associate Professor of Jazz Composition at Berklee College originally from Singapore, and a pupil of Bob Brookmeyer in his latter years – he appeared as a soloist on her second album. Brookmeyer's influence can be felt throughout these seven pieces. The Colours Jazz Orchestra, an Italian group led by Massimo Morganti, face the fierce challenge of playing this difficult music with aplomb. You’re Leaving? But I Just Got Here is an “animated conversation” between orchestra and drums where sinuous lines of melody weave in and out. La Maida, Giardini and the orchestra add to the discussion and it all ends amicably. Joe Henderson’s Recorda Me starts with dissonance throughout the intro before flowing into a tasteful reading of the theme. An elegant tenor solo from Sebastianelli complete with moments from ‘outside’ lead to a nicely resolved, quieter, ending. Hang Around - a funky, swinging groove with accents in unexpected places – how far out can a blues go? This is further out than George Russell’s Blues In Orbit or Sun Ra’s Saturn! Soloists include Morganti, La Maida and Manzi. La Danza Infinita, a stately dance in ¾ time begins with a melancholy woodwind ensemble leading into a multi-layered section of melody, counter-melody and more trombone from Morganti. Finally, the brass ‘Choir’ restates the theme in ‘Chorale’ style. Down A Rabbit Hole, an up-tempo, technical ‘tour de force’ - the theme a headlong dash of clashing, interwoven lines full of unexpected twists and surprises – challenging for players and listener alike! Sebastianelli has the tenor solo. Wintry Mix, a flowing blend of themes in a reflective mode. Brass, woodwinds, saxes, guitar and Marinelli's piano constantly intersect and interact. Finally, Daniel Rosenthal's Subo, a festive, fiesta calypso and, perhaps. the most ‘conventional’ track on the album with solos from guitar, trombone, baritone and alto saxes. Two quotes about Ayn Inserto are worth repeating here; “She’s Maria Schneider on steroids”! (Harvey Siders –Jazz Times Sept 2007). Simone La Maida, Maurizio Moscatelli, Filippo Sebastianelli, Antonangelo Giudice, Marco Postacchini, (Saxes & Woodwinds); Giorgio Caselli, Luca Giardini, Giacomo Uncini, Samuele Garofoli, Jeff Claassen, (Trumpets); Massimo Morganti – Leader – Carlo Piermartire, Luca Pernici, Pierluigi Bastioli, (Trombones); Emilio Marinelli, (piano); Luca Pecchia, (Guitar); Gabriele Pesaresi;, (Bass); Massimo Manzi, (Drums).